I love old magazine advertisements like this, they are full of color and character. This page has no date anywhere, but judging by the pictures on the other side, I’d say 1940s or 1950s. 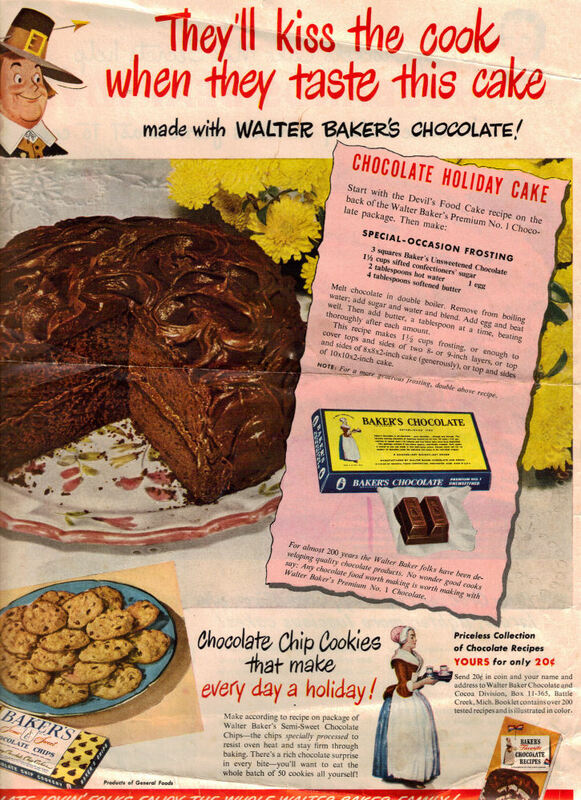 The recipe below was to compliment a “Chocolate Holiday Cake” which was on the back of the boxes of Baker’s Chocolate you bought. Recipe is typed below as-is, you can click the picture to view a larger size if you like. Melt chocolate in double boiler. Remove from boiling water; add sugar and water and blend. Add egg and beat well. Then add butter, a tablespoon at a time, beating thoroughly after each amount. This recipe makes 1 1/2 cups frosting, or enough to cover tops and sides of two 8- or 9-inch layers, or top and sides of 8x8x2-inch cake (generously), or top and sides of 10x10x2-inch cake. NOTE: For a more generous frosting, double above recipe. For almost 200 years the Walter Baker folks have been developing quality chocolate products. 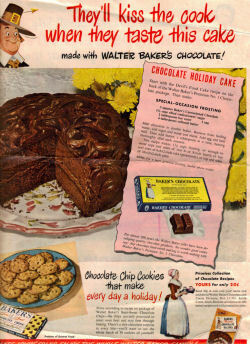 No wonder good cooks say: Any chocolate food worth making is worth making with Walter Baker’s Premium No. 1 Chocolate.